Sidcot and Oakridge are the hamlets which lie to the east of the A38 from Winscombe village. They are outside the Settlement Boundary and have been vigorously protected from development by the Winscombe and Sandford Parish Council for at least the last 50 years. Most of the associated landscape is designated as Area of Outstanding Natural Beauty (AONB). 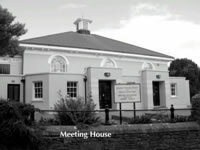 The oldest survving house is Harbury or Hartbury Batch which dates from 1718 being the original Quaker Meeting House. A single room was built on the backof the house eventually to become a schoolroom for about 10 children of Quaker families who, together with other Non-Conformists were not allowed to attend the village schools at the time. Sidcot School proper was founded in 1808 and together with about five or so houses until the start of the twentieth century was identifiable as the community of Sidcot and Oakridge. Later in the 18th Century, Combe Cottages, a predecessor of the present Combe House (built about 1862), Sidcot Farm and a property known as Kidbury, later Kidborough Cottage, with the adjacent Meadowside were established. Rose Cottage and the present Combe House were built either by the School or by members of the Meeting. Oakridge House was the other significant property in these hamlets. The only developments since that time have been Oakridge (1930's and 1960's). Associated with Kidbury is a field of about three acres, now known as Belgian Avenue Field. The field lies on the corner between, on the North Side, Fountai Lane and Oakridge Lane on the East. Fountain Lane is a narrow ancient country lane described in Quaker papers of 1690 as "the way that leadeth from Sidcot to Woodborrow". The school, Sidcot School, is an independent day and boarding school for boys and girls aged thirteen to eighteen. Belgian Avenue Field is overlooked by all the old properties which form part of the landscape and is a focal point for the community. The field, a typical Somerset permanent grass pasture, has been used since ancient times as a track to the Mendips, the drove roads and thence to the national network of tracks and byways and it now contains a long recognised Public Footpath enjoyed by locals, walkers and the many tourists to the area. The late professor Mick Aston recorded a few fragments of Anglo Saxon pottery in the Eastern part of the field which, he conceded, might be stray finds but he considered that the area would have formerly contained a medieval farmstead site probably close to the cottages. The path is bordered by a historic Beech Avenue, Belgian Avenue, which was planted as a thank offering after the First World War by Belgian refugees who had been housed by Sidcot residents for the duration. All the trees are subject to TPO's, but they are at appreciable risk because of the limited soil depth (20-50cm) overlying the rock of the Mendip Hills.